With each day, more and more people become participants of the cryptocurrency market. There are now long-term investors following the buy & hold strategy, traders who partake in regular trading operations, and large cryptocurrency funds. Nonetheless, many people still reject entering the market. The absence of utilizing cryptocurrencies within the bounds of business models as well as the absence of regulations act as entry barriers for companies. Individuals frequently don’t have time or energy to study all of the market’s mechanisms and purchase a cryptocurrency. Limited amount of banking services. Limited selection of financial instruments. Difficulties with converting cryptocurrencies to fiat. Exchanges crash during peak loads. Issues with registering and passing verification. Big losses due to hackers attacks. A near full absence of cryptocurrencies being utilized as a means of payment. Absence of insuring trades and transactions. All of these factors act as serious barriers, which can impose a limiting effect on the development of the cryptocurrency market, as well as the mass use of cryptocurrencies. The existing projects try to solve separate problems, while in general, the situation practically does not change. According to our opinion, a comprehensive approach is required. We see the solution in creating a financial ecosystem, a business model which will be oriented towards eliminating the issues of all active cryptocurrency market participants, as well as removing market entry barriers. Neluns will achieve this goal through creating the most convenient conditions, tobroaden the possibilities of current participants and open up access to the cryptocurrency sphere for a broad range of users. 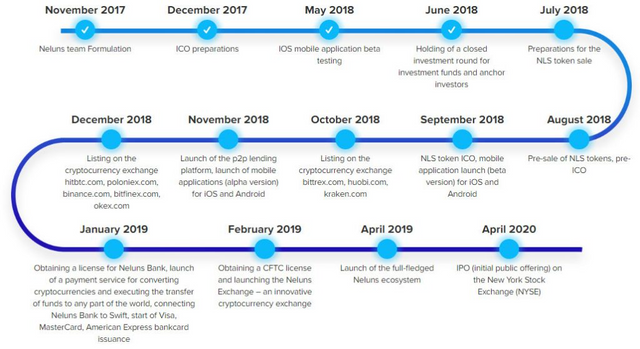 Neluns will become the cryptocurrency markets development catalyst. 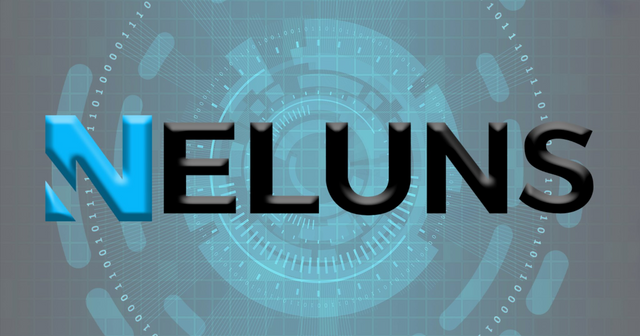 NELUNS MISSION – is to create an innovative financial ecosystem, combining within itself a bank, which operates with fiat and cryptocurrencies, a cryptocurrency exchange and insurance company, thus, creating conditions for the quality development of the cryptocurrency market and inflow of new participants and new capital. Purchase and sell cryptocurrencies in just a few clicks. Lead active cryptocurrency trading on the exchange. Deposit and withdraw funds from the system in just a few clicks from any part of the world. The Neluns team aims to minimize risks and build out the project in accordance with all legal norms. We are carrying out work on receiving a banking license. 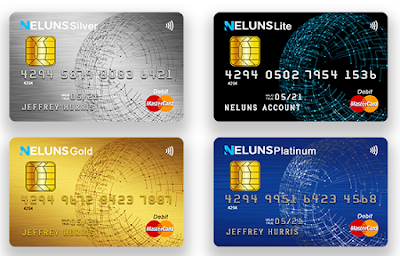 Neluns will comply with all FCA (Financial Conduct Authority) and PRD (Prudential Regulation Authority) requirements, which handle the issuance of licenses and bank activity oversight on the territory of the given country. The exchange and insurance company, Neluns, will also be registered in accordance with regulatory requirements. To start working with the Neluns ecosystem, users will have to pass a verification procedure. 1-st level – email verification. Allows participating in trades on the Neluns Exchange (with 1:5 margin trading). Trade sums cannot exceed $300. 2-nd level – social network and mobile number verification. Allows participating in trades on the Neluns Exchange (with 1:10 margin trading) and the P2P lending platform. Trade sums cannot exceed $500. 3-rd level – identity and mobile number verification. Users gain access to all Neluns Bank services, Neluns Exchange (with 1:20 margin trading), Neluns Insurance. Restrictions on trade amounts are absent. Instant fund transfers, withdrawals and deposits at ATMs anywhere in the world. Debit and credit visa, Mastercard, American express card. Buy and sell cryptocurrency in two clicks, exchange crypto for fiat. The principle of "bank guarantees". Withdrawal of funds is easy, transaction speed is highest. Effective user support services API and trade on the Nelun exchange through known software such as Fusion, TAKION, MetaTrader, Metastock, ROX, and others. 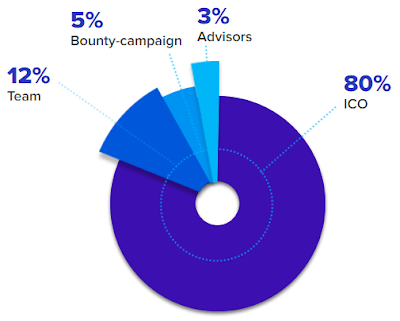 80% - Ecosystem development; investment in the purchase and improvement of traditional banking software; development of our own software and ecosystem functionality; Neluns applications for Windows, macOS, Android, and iOS; investment in work and bank capital, cryptocurrency exchange, platform insurance (these funds will be used as a part of the activities of all elements of the Neluns ecosystem and provide additional operations). 3% - Personnel salaries, offices, legal registration, obtainment of all necessary licenses, connection to payment system and SWIFT, legal and consultation services. 10% - Marketing, hosting a marketing campaign and attracting a broad range of clients to use the Neluns ecosystem. 7% - Reserve fund, will be used to support NLS liquidity.